The Alumni Relations Office organized a reunion for the Sir John McGuckin Mentoring and Internship Program Alumni on Friday, 11 May 2018. Brother Denis Loft, Vice President for Advancement, and Ms. Haneen Musleh, Alumni Relations Officer, greeted and welcomed the alumni on this special day. The reunion brought back all the good memories about the internship program and the time they spent at the University during their studies. The alumni reflected on the great and positive influence of the program on their careers and social life. A lot of them are still in touch with their host organizations and host families. The program, established in 2010, is supported by gifts from the Grand Magisterium in the Vatican, EOHSJ - USA Northwestern Lieutenancy, EOHSJ - USA Western Lieutenancy, the Canada Atlantic Lieutenancy, CNEWA - USA, CNEWA - Canada and a number of other individual donors. Catholic Charities, Manhattan College and Loyola College have provided additional financial and logistical support for the McGuckin Program. The Alumni Relations Office envisions any internship as an opportunity for our students to integrate and use their knowledge and skills from the classroom, gain real-life work experience, and develop professional skills that are much needed to enter professional life after education. Bethlehem University expresses its gratitude for the growing support from the members of the Equestrian Order for assisting our students with career-focused internship opportunities. 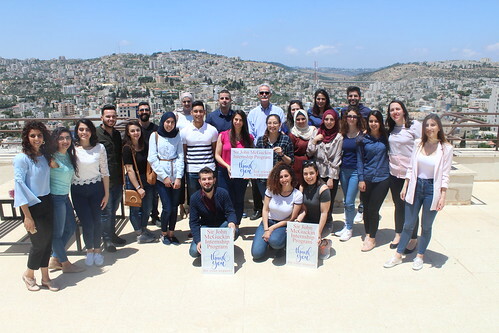 This Program is shaping a brighter future for the students of Bethlehem University in a most significant and sustainable way. Sir John McGuckin is the late former Lieutenant of the USA Northwestern Lieutenancy of the Equestrian Order of the Holy Sepulchre of Jerusalem who mentored young people in their lives and careers.